Our parent company, H H Gold, Inc. has been serving custoners who seek something extraordinary since 1985. New items are added to this site daily. If you're fascinated with the idea of owning a genuine piece of history as I am, then you're sure to find that special piece that "talks" to you. On this site you can find coins from the time of Alexander the Great (336-323 B.C.) set in fine 14kt or 18kt gold pendants, as well as high grade NGC graded ancients coins, "pieces of eight" treasure coins, and other high quality unique jewelry. I hope you enjoy our selection of unique and special pieces and become one of our customers. 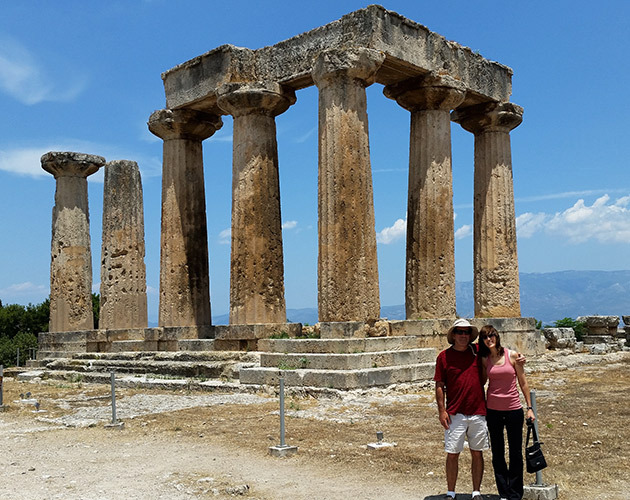 Howard and his wife Beverly at the temple of Apollo in Ancient Corinth, Greece. All coins and coin jewelry come with a 14 day return privilege as long as the item is undamaged and in its original condition. If, for any reason, you are not satisfied, simply return the unused item in its original condition within 14 days of receiving it a full refund or exchange. A return authorization code is not required, just let us know you are returning the item. Jewelry that has been repaired, sized, altered, or damaged in any way will not be accepted for return. Gold and silver bullion coins (coins that sell within 25% of their precious metal value) will be accepted for return, but the refund amount will adjusted depending upon the current precious metal prices. Pack it carefully and wrap the item in the original packaging. If you do not have the original packaging, make sure that the items are wrapped in a way that protects it from damage. Flat envelopes are not recommended for shipping. Please include the packing slip or invoice that came in the package or a printout of the order confirmation email. Please let us know why you’re returning the order. Also include the certificate of authenticity if sent with original order. Check your email. Within 10 days of receiving your package, we will send you an email to notify you that we have received and processed your return. It usually takes 5-7 business days of processing for the credit to appear in your bank statement. Please follow the same procedure for returns for a refund, except include a note on which item you’d like to exchange the return for. Check your email. Within 10 days of receiving your package, we will send an email to notify you that we have received your exchange and sent your new order. We will charge your credit card if the item exchanged for is of greater value, or credit your card for the difference in cost if the cost of the item you return is greater than the cost of the item you’re exchanging it for.